It is somewhat mystifying to read financial blog posts about Google (GOOG) that imply the company does nothing but search advertising. Analysts obsess over Google's share of search traffic, their search ad click-through-rates, etc. Though the search advertising business has undoubtedly been the largest driver of Google's business, the company has strong revenues from its AdSense product which is, in essence, a very loose ad network. Indeed, fully one third of Google's profits are derived from AdSense. Another source of annoyance to me is the opinion that search advertising is the only valid online advertising model. Those who hold this view generally assume that display advertising is dead and banner ads are obsolete. Google has now closed the deal to acquire DoubleClick. DoubleClick's business is focused on serving display ads on their own ad network. Did Google make a mistake? Hardly. sites with less than 100k monthly unique users, Google has an 8x share advantage over 2nd place MSN." There are a couple of takeaways from this analysis. One is that search advertising is clearly not the only game in town. Second, the combination of Google and DoubleClick is far stronger than either one alone and definitely stronger than their major competitors. The strength in the combination lies in the breadth of the offering. DoubleClick has built an ad network utilized by some of the biggest sites on the web and focused on display ads. Google has also built an ad network but it is based on the thousands of sites, big and small, that have signed up to host AdSense ads. Add to this mix the dominant search ad business that Google pioneered and it is clear that Google is turning into an even tougher competitor. AOL, Yahoo and Microsoft are increasingly being left behind. With analysts projecting a decline in paid clicks, Google has seen its stock price hit the skids. It bottomed out in March at around $413 and now, at about $467, is just under its 50-day moving average. Many technical indicators are starting to line up positively. 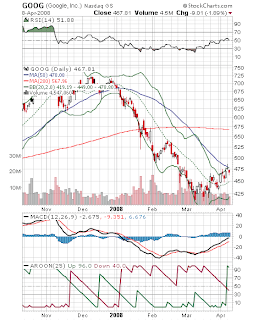 As can be seen in the chart below, MACD is currently bullish and Aroon is indicating an up-trend is beginning. Though not shown in the chart, DMI is just starting to swing positive. Also not shown is the Chaikin Money Flow which, similarly, is starting to show growing accumulation. With the stock up against the top of its Bollinger band range, it would not be unexpected to see it retrace a part of its recent advance. Barring another big drop in the overall market or a big earnings miss, it seems the company is poised to break out. It is true that the current economic malaise does seem to be having an impact on e-commerce and Google will, no doubt, find it hard to escape seeing profits pulled down to a certain extent. Nevertheless, the company's growth rate has not come close to going negative though many analysts feel it may be slowing. With the integration between Google and DoubleClick barely started, it is not unreasonable to expect that eventually the combination of the two companies will result in a whole that is greater than the sum of the parts. As pointed out above, the two companies are complementary and dominant in their areas of expertise. As long as the company cultures mesh reasonably well, it is logical to expect these two companies to build on their strengths and continue to extend market share. That has to be beneficial to Google's share price.